Are all your tools and work supplies cluttering up your garage? Does your family constantly complain about the mess? Well, don’t worry; we have the solution for every handyman out there! 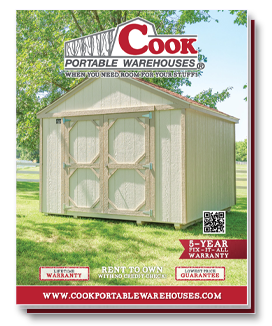 Why don’t you make your own workshop space right in your backyard with a Cook Portable Warehouse? Our buildings are the perfect place for any and every hobby! Just remember to make it functional, organized and personalized to your needs! 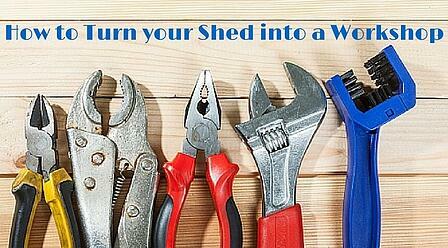 Here are 4 keys to creating the best workshop in your backyard storage shed! This is one of the most important spaces in your workshop because it’s where you work! This surface should be large enough to accomplish your bigger projects and sturdy enough to complete them safely. Make sure you have a different storage space for tools and don’t keep them on top of your work surface. This can become a safety hazard. Smart storage solutions for tools are vertical shelves, cabinets and pegboards. Don’t forget the workbench, which you could buy or even make from scrap wood. A good way to make sure your work surface lasts the test of time is by staining rather than painting it. Staining will ensure the surface looks pristine throughout the years and all those scratches and scraps. The right storage space is key to creating your perfect workshop. It’s important to have enough storage for all your tools, supplies and equipment. Consider that big, upcoming project you might have planned in the next year or two. Consider how much stuff you have now and what you might accumulate in the future before deciding on what size shed you need. Use the Cook Customize your Building Tool to get the building you want according to your exact specifications. All tools should be kept at an easily accessible height, so you can grab them while working. Good simple solutions include drawers and adjustable shelves. Don’t toss small pieces like nails, screws and hand tools into drawers where they will get lost. Small jars, Ziploc bags or even an old muffin tin are great solutions to this problem. Proper lighting is key to keeping your workshop a safe place to get those projects done, especially if you tend to work late at night or early in the morning. Because Cook sheds come with a window option you will get some much needed natural light. But, it still might be essential to add additional lighting either in the form of a battery powered generator or by hiring a professional electrician to wire your building. We already talked about how important a window is for any workshop to provide light and air flow. But there are other extras that can make your workshop perfect. Hang up some of your favorite artwork or posters and get a stereo to play music or a radio to listen to games. Another good idea is to have some basic cleaning supplies on hand to keep your workshop in like- new condition. A Shop-Vac or handheld vacuum cleaner will help keep the dirt and dust at bay. One final tip is to have fun and find time to relax in your workshop. We know you have projects to complete, but it should also be a space for you to enjoy! To learn more about how one of our Cook Portable Warehouses could fit perfectly into your life as your new workshop building, download our free Fitting Guide below!